Ticket Statuses reflect the current state of a ticket and are completely customizable on a per ticket type basis. Keeps Users prioritized: Ticket Statuses are used to identify major and interim steps that a ticket might be in at any given time. This granularity allows your users to quickly filter through tickets on their Ticket Grids based on statuses. For example, a User may want to focus first on tickets with a status of “New” or “Customer Replied”, as opposed to tickets with a status of “On Hold” or “Pending Customer Reply”. This allows your Users to be able to prioritize themselves and keep their tickets organized. Metrics: Ticket Statuses can give Supervisors insight into how long response times are, and other important metrics. You will find a table called “Ticket Status History” in our Reporting tool which will allow you to analyze this data. Can be managed in Ticket Automation: You can automatically change a ticket status using Ticket Automation. One common use of this is to have a status called “Pending Closure”. Your users can select this status, then a few days later, Ticket Automation can actually close the ticket by updating the status to “Closed”. This may be used if you feel like you need to give your Customers a heads up before the ticket actually closes. Keeps Customers in the loop: Status are displayed on the Customer Hub for your Customers to view. If you find that your Customers often ask questions regarding what the status is of their accounts, directing them to the Customer Hub will allow them to find this answer on their own without a request from your Support team. Bulk status changes: You can change multiple statuses at once from the Ticket Grids. Ticket statuses are completely customizable and are unique to each ticket type. Having unique status based on your ticket types allows you the flexibility to define different workflows for different types of tickets. For example, you may have a ticket type called “Billing” which has unique steps and status that are not found in any other group or type of ticket. You can create as many statuses as you like, and can also configure Workflow around them. To customize your ticket status, go to the Admin section on the left hand navigation, then select the “Custom Properties” tab. Select “Ticket Status” from the “System Property Type:” drop down menu. Finally, select the ticket type you would like to work with. * The first status in the list will be used as the default status. This is the status that will be used when a new ticket arrives in your system, so we recommend calling this status “New”. The statuses will appear in the dropdown list on a ticket in the same order as they appear in this list. To rearrange statuses, or to change the default, use the up and down green arrows. From here, you can modify all of the possible “steps” or “statuses” a ticket can be in during its lifecycle. Name: This field names the status. The name will appear in the drop down list on the Ticket Page and throughout TeamSupport and the Customer Hub. This field is required. Description: The Description field is optional. It will be displayed in this admin menu to give a brief description for what the purpose of the status should be. Is Closed: This field will tell TeamSupport that the ticket is in a closed state when this status is selected. You may have several statuses which indicate the ticket is closed. For example, in a Task ticket, you may have closed states for “Completed” and “Abandoned” – Both with indicate that the ticket is closed, but with different results. Send Closed Email: This setting will force TeamSupport to send a specific email message to you customers when a ticket is closed. The template for this email can be customized by going to Admin->Email and editing the template for “Ticket Closed”. Please Note: This setting applies to the “Ticket Closed” email only. To prevent Ticket Closed and Status Update emails from being sent when a closed status is selected, you must set “Send Closed Email” = False AND “Disable ticket status update emails” = True. The “Disable ticket status update emails” is found under Admin -> My Company -> General Tab. By default, a Ratings message is embedded in your Closed Email template. Email Response: This field can be “True” for only one of your statuses, and you might choose to call this status “Customer Replied”. If a customer updates a ticket that has a status other than your default status (described above) either via email reply or from the Hub, it will get updated to this status. Oftentimes a customer will submit a ticket, and then reply quickly back to the confirmation email before your team has a chance to respond to the ticket. For this reason, if a ticket is in the default status, and a customer replies, the status will not be updated. This email response status is important because it will indicate that a customer is waiting for your response. You may also wish to capture metrics on this status, and the default status, to determine how long your customers wait to hear back from your Support team. 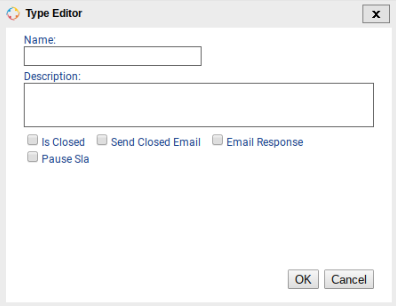 Pause SLA: If you will be using the SLA feature, you may want to pause the timer on the SLA on certain statuses. For example, you may not want to include time spent where you are waiting for a response from a customer. In this example, you may have a status called “Pending Customer Reply” which has the Pause SLA box checked. Customer Emails Upon Status Change: You have the option to send email updates whenever there is a status change on a ticket. This may help to keep your customers up to date with the ongoings of a ticket. The setting can be found under Admin -> My Company tab -> “Disable ticket status update emails”. By default, this setting is “False” which means if you have a ticket that is marked “visible to customers” and a contact associated to the ticket, each time the status changes on a ticket, an email will be sent to the customer. This email template is called “Ticket Update” and can be configured in your admin section. Workflow: To add workflow to these ticket statuses, please remember you need to visit the Workflow tab after your status have been defined. More specifically, what statuses will be visible as next possible selections based on the current status selected within each ticket.